Over the years I have seen many people struggle with the handgun. Some older folks and others with limited hand strength have a difficult time with the revolver. While revolvers are simple enough to handle, the long double-action trigger press challenges some shooters. As an example I knew a woman about my age well that had suffered a serious injury in a fall. My friend had courage and worked herself back into shape by lifting weights and constant action. But she never regained full hand strength and could no longer handle her .38 revolvers. Another purchased a snub-nose .38 but simply could not handle the recoil. She adopted a Walther PPK .32, far from ideal for her, but she was able to handle the recoil of the self-loader. Semi-automatic pistols transfer part of the recoil into energy to work the slide; the recoil spring absorbs some recoil. A self-loader doesn’t have a stiff trigger action if the pistol is properly designed. Another impediment, however, is that the slide may be difficult to rack. The recoil spring must be compressed as the pistol is loaded by racking the slide. A 9mm designed to handle +P loads will have a heavy spring. If you are able to handle this type of handgun that’s fine but many of our brothers and sisters cannot. Some will prefer the version with a manual safety while others will find the grip safety safety enough. It is difficult for some folks to be able to chamber a cartridge if the recoil spring is heavy. A person needs a handgun that compliments their abilities, not challenges them unduly. 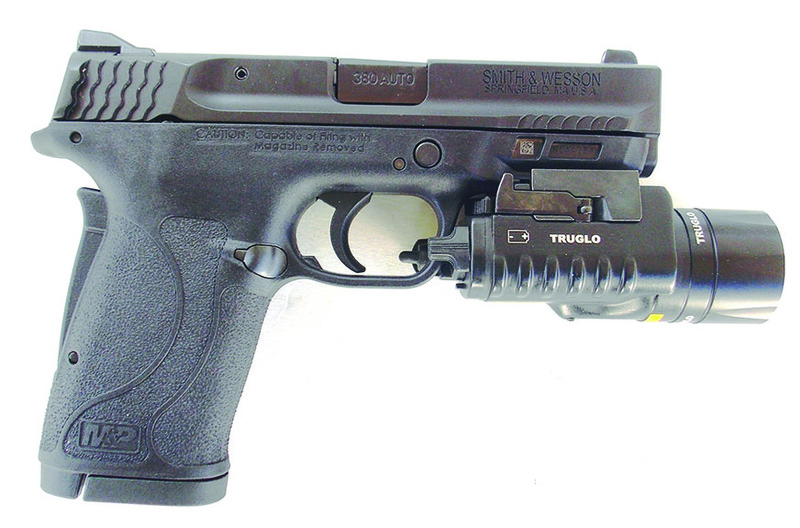 Smith & Wesson has introduced a pistol based on the MP22 frame. The new Smith & Wesson Military and Police Shield .380 ACP has the modern 2.0 Shield improvements. The slide features well designed cocking serrations that make for easy racking. The front of the slide is scalloped to allow easy manipulation. The frame also features the new 18 degree grip angle that makes the 2.0 pistols set so well in the hand. You have a good feeling of control with this handgun. I really like the handling of the Smith & Wesson Shield .380. The pistol isn’t one of the micro-sized .380 pistols introduced during the past decade. The Shield is a full size .380 you might say, larger than a Walther PPK. The handling and design are reminiscent of the immensely popular Colt 1903 handgun. Going to this size pistol results in a handgun that is easy to handle, comfortable to fire, and with excellent accuracy in offhand fire. Another feature of the pistol is that the force needed to rack the slide is less than many other handguns. The Shield isn’t striker fired but features a hidden hammer. The recoil spring, designed to contain the recoil of the .380 ACP handgun, isn’t as difficult to rack as 9mm rated handgun springs. 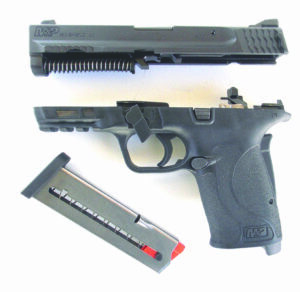 The leverage of the slide and recoil spring is good and makes for an easy handling handgun. Even though I have been handling firearms for several decades, including high capacity magazine pistols that are sometimes difficult to top off, I still have difficulty with some pistol magazines. I keep the Butler Creek magazine loader handy to load high capacity 9mm magazines and also the AR 15. The Smith & Wesson Shield .380 EZ pistol features easy to load magazines. These magazines feature a tab on the body that is pulled down to load the magazines. The single column magazines are easy to load but have plenty of spring pressure to keep the pistol feeding. 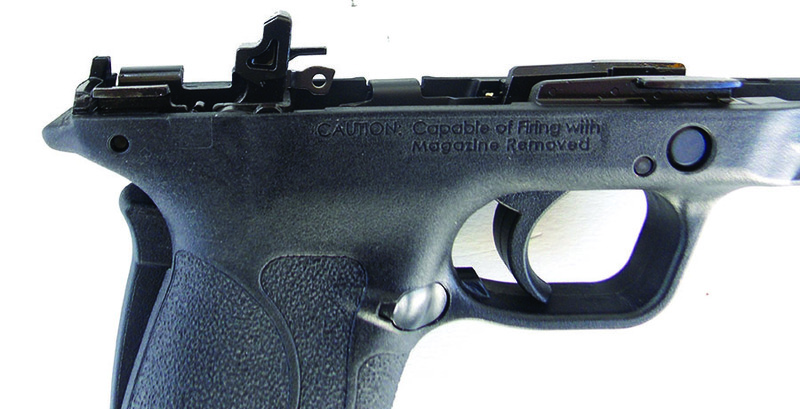 Hinged triggers and triggers with a finger lever safety are standard for modern pistols. 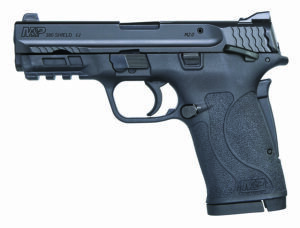 In contrast, the M&P Shield .380 features a single piece single action trigger. This trigger allows a clean trigger break. I was pleasantly surprised to find the M&P Shield .380 trigger broke at 5.0 pounds and clean. Field striping and maintenance is easy enough. of safety as well. The Military and Police Shield .380 features a hinged grip safety. This safety must be depressed in order to fire the pistol. The grip safety doesn’t require a great deal of effort but makes a good safety feature. If the pistol is dropped the grip safety pops out and the pistol is made safe. There is also a version with the thumb safety of the MP 22. I prefer a manual safety but can live with the grip safety. I simply obtained the first pistol available and that was the version without the thumb lock safety. As a side note when John Browning designed the Browning 1910 he tried to convince FN that the grip safety was the only safety needed, but they insisted on a thumb safety as well. The grip safety of the M&P .380 does the job. The Shield .380 is easy to rack. It is a pistol with ergonomics first. The Shield .380 is easy to use well. The slide is easily racked with only two fingers. The magazines are easily loaded. The three-dot white outline sights offer an excellent sight picture. Ammunition selection is critical with the .380 ACP cartridge. Some pistols are not reliable with a wide range of ammunition. 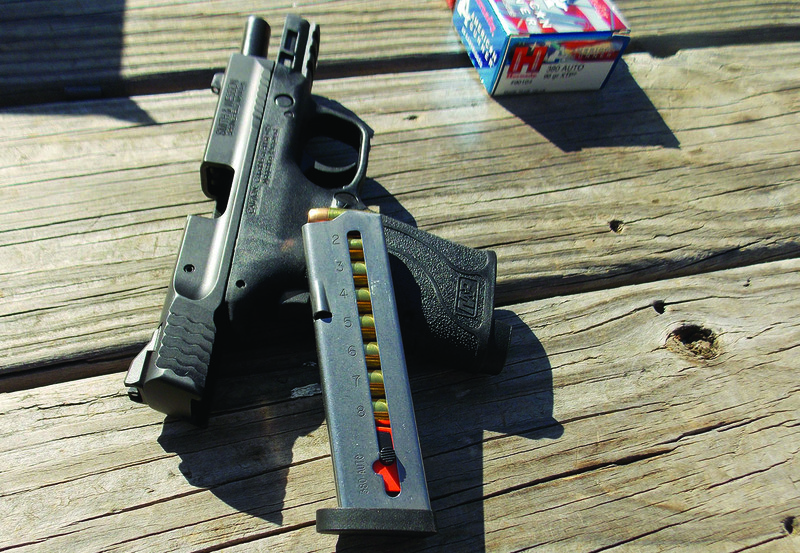 Most pistols should be loaded with only the 90 to 100 grain loads. Light bullet loads and those that use specialty bullets do not make for the degree of reliability I like. There simply isn’t a surplus of power. I have fired the Shield extensively with a variety of ammunition and found a useful handgun that is always reliable. The sights are well designed for precision shooting, the piece is simply easy to use well. I have fired at humanoid targets at 5, 7 and 10 yards and fired from the retention position as well, a sure test of a pistol’s reliability. With the TruGlo combat light, the Shield is a formidable home defender. The Shield never, never stuttered and provided excellent results. The magazines were very easy to load. A good test is to fire a full magazine as quickly as you can recover the sights in recoil. Doing so I have fired groups as small as four inches for eight shots. Black Hills Ammunition offers a 100-grain FMJ loading. This load is 5 grains heavier than the average .380 ACP FMJ load. This makes for good penetration and better momentum in a handgun that may not have been properly cleaned and lubricated. 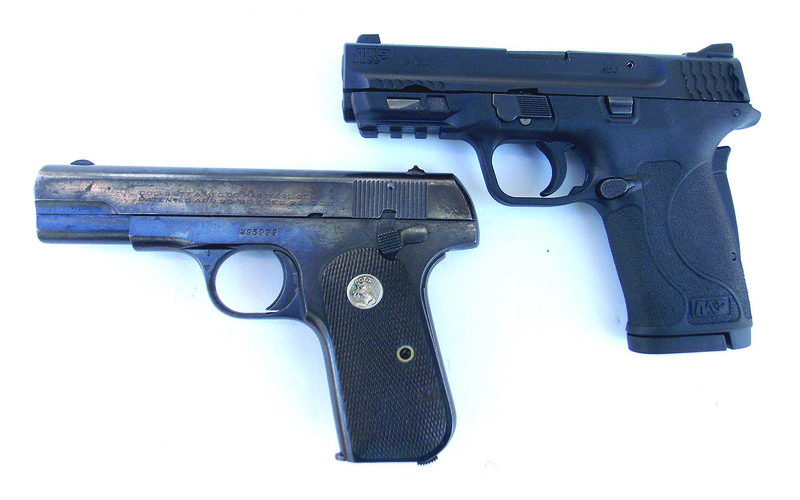 The Shield is lighter but slightly larger than the Colt 1903 pistol. 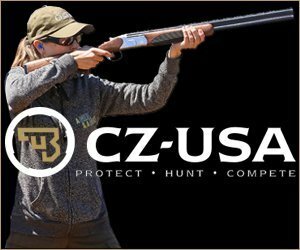 A good choice for personal defense is the 90-grain JHP loading. At about 950 fps this load is controllable and offers modest expansion, all we can expect of a .380 ACP bullet. Black Hills offers the 60-grain Honey Badger that leaves the Shield’s barrel at a blistering 1200 fps. This lightweight bullet is well machined of solid brass and features flutes that begin cutting flesh on contact. It doesn’t expand and exhibits excellent penetration. The Smith & Wesson M&P Shield .380 has many good features. The sights are good, the trigger is crisp, the pistol is easy to operate. The safety doesn’t require thought to manipulate; just make a firing grip. The Shield magazines feature a stub for loading. Simply pull the magazine follower down to load. This works well. The pistol is easy to use quickly and those that practice will be delivering accurate fire. 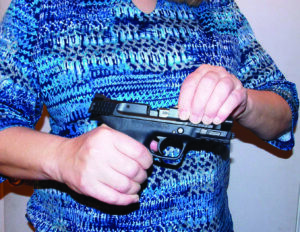 Those with limited hand strength or who have experienced an injury will find a pistol to use well. As for the easy racking slide, we did a side test to determine if the slide would go out of battery in tightly molded holsters and purse holsters. The answer seems to be that there is plenty of spring pressure to keep the pistol locked into battery. I like this pistol a lot.